Adorable...gave as a gift...My friend loved it!!!!! 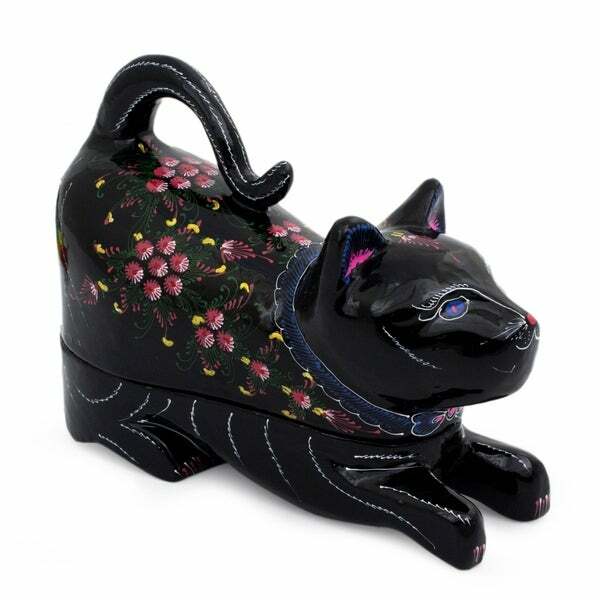 Handmade 'Kitty Cat Happiness' Lacquered Wood Box (Thailand) - 4.7" x 4.5"
This handmade creation is offered in partnership with NOVICA, in association with National Geographic. Pouncing playfully, a sleek black cat curls his tail over his back. It forms the handle for a hand-carved, lacquered box. Nantana Sompamitre transforms mango wood into a Korat or Si-Sawat(happiness) cat. The elegant cat was owned only by royalty and courtiers. It's all up to chance – it's up there in the air and you just have to grab it. If I hadn't, I would still be selling food. My name is Nantana Sompamitre and you can call me 'Nan.' I was born on May 1, 1950 in a calm and peaceful village in northern Thailand. My family is large; I have eight brothers and sisters. We are a family of artisans. Instead of going to the fields, my father and mother made the umbrella's topknot. My father is a craftsman and was always teaching us. My brothers and sisters helped our parents in one way or another in the running of their business. I am the one who was able to make the shape of the knot. I started helping my parents when I was 13 years old but quit when I was 17. At that time I had just graduated from high school and I wanted to do something more to help my parents. Fortunately, my cousin had a food shop and I became a vendor. Under good conditions this is generally a good line of work, and eventually I met my husband. He is the man who changed my life completely. He is an artisan working on lacquer ware. His main job was to paint the motifs on the different pieces. We married when I was 23 years old. One day, my husband and I discussed our future and we realized that with his skill and mine, we could open up our own lacquer ware workshop. He taught me every step involved in the creation of lacquer ware. Thanks to my crafting background I learned quickly and within a year I took part in every step of the creation process, even hand-painting the motifs. We then needed to become known yet. My husband and I went to Bangkok and got our first consignment order! Gradually more shops took an interest in our work and we soon began to sell more, so we were very happy as we could see we had a bright future ahead of us. Now we have more than 30 artisans working with us, and my husband and I always train them personally. This is my most proudest thing in life. I never dared to dream of a day like this. I would not have made this on my own. It's all up to chance – it's up there in the air and you just have to grab it. If I hadn't, I would still be selling food. I love this craft very much. It is a Thai heritage and not everyone can do it. My work is always developing in quality, color, shape and design. We all work together as a team and everyone presents his or her own idea. I have a son and a daughter. My son is 26 and studies computer engineering at the state university and my daughter has just graduated in business management. They are my hope and thanks to our handicrafts, I think they will be successful in life. I think Novica is the best channel in this day and age to show who you are and what you are doing. Novica will help my handmade be known around the world for the people who love this kind of work. What more can I ask for? Thank you Novica, and I hope everybody loves my handmade too! Dimensions 2.4 In. X 4.7 In. X 4.5 In. Intricate painting of flowers and facial features on a black lacquered cat shaped box. Love it because it reminds me of my black cat. So glad that I bought it. I still gave this item 4 stars because it is beautiful and it is my fault for not realizing how small the dimensions were. I did read them it just didn't "sound" as small as it said in the details and combined with the image I was surprised and disappointed. It is beautifully made, hand crafted and hand painted. It has a very nice shiny smooth top coating so even though it's a dark color it makes it pop. It was a gift but, again with the size it was intended as a trinket/jewelry box but will be more of a decoration. This would be the third one I have purchased - gifts for two others and one for myself. All with a special cat in mind. Box is great and very colorful. I bought this for my grand daughter and omg...she really loved it, her father bought her a black piano...and I gave this to her to set on top of it, and it looks so good! The box is Beautiful!! It has a high gloss and very delicately hand painted. I love it!! This little box is perfect for pins paperclips, and other tiny things that always seem to get lost. The paint is beautiful and the craftsmanship is excellent. Utterly charming folk art, could be used to hold a favorite piece of jewelry or not. Very decorative.. I ordered two to flank two night tables and they look fabulous. Well-made and they add whimsy. it was smaller than what I thought but so cute I love it. Disappointing. I could have gone to Chinatown and found the same thing much cheaper.